I am grateful to Dillon Knackstedt, a former student of mine at Thomas More College of Liberal Arts, who brought to my notice a resource for anyone wishing to pray the Divine Office of the Anglican Ordinariate. It all the ordinaries and propers for Morning and Evening Prayer, Midday Prayer and Compline, available at prayer.covert.org/. 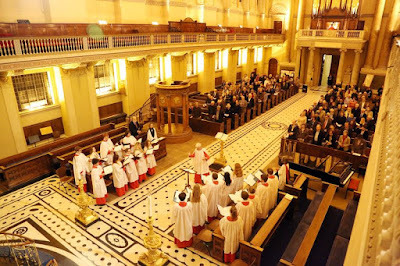 You don’t need to have a grand production like the one shown in the photo above, such as one might see in a cathedral or an Oxford college. We can pray at home in our icon corner. For people wishing to learn to sing the Office (in any form) in English using simple tones based on the Gregorian chants, you can learn in a course offered by Pontifex University called Singing the Divine Office in English. I developed this material while teaching at Thomas More College, where as part of my class, the Way of Beauty, which all students took, they were required to learn to sing the Office. Some of these tones were set to harmony by composer Paul Jernberg, and this Magnificat is the version that we used to sing weekly for Veterans in the VA hospital in Manchester, New Hampshire.